To get a grip on a busy inbox, keep on top of important emails by giving them Superstars. And with multiple inboxes in Gmail, you can have one of those inboxes just for showing messages with one of those stars. 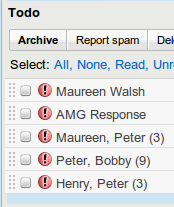 So 5 entries from my TODO list sits above my inbox. That way I'm always atleast concerned with keeping on track. There are other stars, but I haven't felt that they make more any more productive. Maybe as I have even more plates to balance.